PodcastPD is back! Stacey, AJ, and Chris are so happy to be creating this podcast for you. 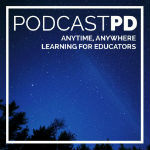 As you will learn in this episode this new podcast is a little different from the original #PodcasTPD Twitter chat.